In the image above: From left: Dan MacKenzie, NBA Canada managing director, MP for Spadina-Fort-York and Parliamentary Sectretary for Housing and Urban Affairs Adam Vaughan, Willa Black, vice-president of corporate affairs for Cisco Canada, and Michael Furdyk, co-founder and director of tech for TakingITGlobal. Behind them on the video screens, Grand Rapid high school students Ivy and Charisma Ferland and Create to Learn’s program manager. The NBA is a Cisco partner and is helping support TakingITGlobal programs. Photo by Alex Coop. The Grand Rapids Generating Station in Manitoba, completed in 1968, swallowed up more than 1,100 square kilometres of land, including territory belonging to the Mosakahiken Cree Nation, a reserve east of The Pas. Sisters Ivy and Charisma Ferland of Grand Rapids say the dam is in poor condition, and it’s concerned residents in the area for years. They want to dig into the story further through a documentary. “The dam is supposed to have a lifespan of about 60 years. That time is coming up … and we’re not sure what’s going to happen with it. It might just break,” explains Charisma. The two girls discussed their documentary idea via video conferencing at Cisco’s Innovation Centre in Toronto during the launch of TakingITGlobal’s launch of two new programs: Code to Learn and Create to Learn. TakingITGlobal, an independent registered charity, was just one of 21 organizations across Canada to receive some of the $50 million the federal government allocated to the development of digital skills for more than 1 million children across Canada. TakingITGlobal’s share of the funding – $2.5 million – went into the creation of the two new programs, which according to them, will complement its existing Connected North program that delivers interactive education services to schools in remote northern communities. Code to Learn is focused on helping educators build new lesson plans around coding using LCSI’s MicroWorld’s EX and JR coding software, while Create to Learn will support 80 First Nations, Inuit and Metis youth, in developing digital, project planning and writing skills. From left, Willa Black, vice-president of corporate affairs for Cisco Canada, Michael Furdyk, co-founder and director of tech for TakingITGlobal, MP for Spadina-Fort-York and Parliamentary Secretary for Housing and Urban Affairs Adam Vaughan and Dan MacKenzie, NBA Canada managing director. The four talk with Create to Learn participants and instructors via video conferencing. Photo by Alex Coop. Charisma and Ivy were two of Create to Learn’s first graduates. They were recently joined by 22 other youth from 11 communities across the country, who traveled to Toronto for Create to Learn’s first three-day summit at the Inclusive Design Institute at OCAD University. There, they learned how to use drones, 360 cameras, and more importantly, how to become leaders within their community. Charisma and Ivy are perfect examples of what the program is designed to do, says Dallas Pelley, Create to Learn’s program manager, who called in from Saskatoon, Sask. during the program announcement in Toronto April 4. And it’s clear that technology is increasing engagement among students in northern communities, where resources are often scarce and school participation is low. According to a study from York University, nearly 90 per cent of students have found the Cisco Telepresence remote learning sessions – used in TakingITGlobal’s Connected North program – made science more enjoyable. These types of programs are going to prepare youth for the jobs of the future, says Michael Furdyk, co-founder and director of technology for TakingITGlobal. In Nunavut, the Northwest Territories and Labrador, teens are monitoring weather data to gain a better understanding of how climate change is directly impacting their communities. In the Northwest Territories, the data collected has shown how permafrost is melting and how quickly it is contributing to landslides. In communities around Iqaluit, students are looking to curb greenhouse gas emissions by opening greenhouses in their classrooms, while calculating the emissions caused by food shipments to the north. Chelsea Pike, an Actua outreach instructor, goes through a lesson with kids in Iqaluit. Photo submitted. The focus on weather data in northern communities is part of Actua’s latest Community Action Project which started last November. The organization, another recipient of the CanCode Funding, is getting $10 million, which will not only help support its Community Action Projects in northern communities, but teach digital skills to 500,000 youth across every province and territory. 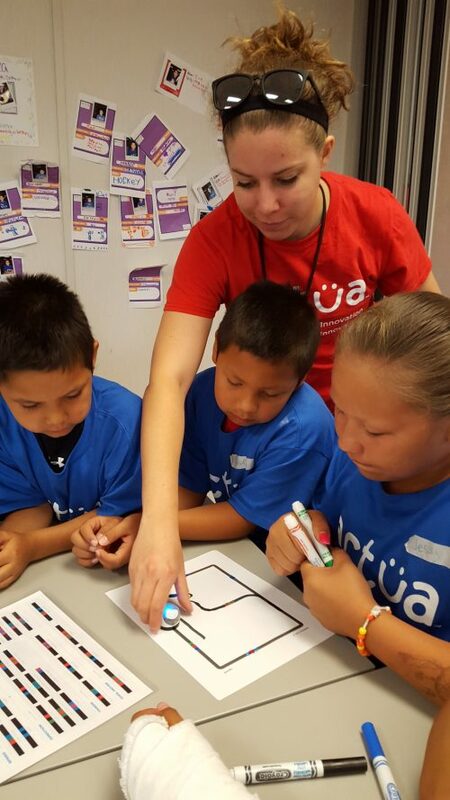 Getting children interested in science, technology, engineering and mathematics (STEM) is much easier when those concepts are weaved into their everyday lives, says Actua president and founder Jennifer Flanagan. Willa Black, vice-president of Cisco Canada, agrees, and says she would like to see even more collaboration among CanCode funding recipients. Furdyk says the foundation for that kind of cooperation is being laid out now.